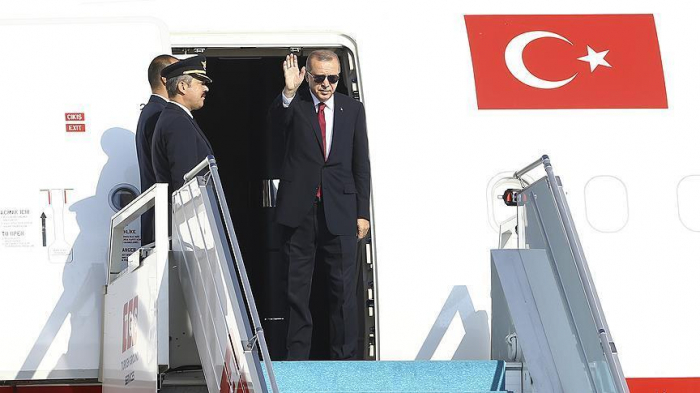 Turkish President Recep Tayyip Erdogan Monday embarked on a two-day official visit to Hungary upon the invitation of his Hungarian counterpart Janos Ader, Anadolu Agency reports. Erdogan was accompanied by his wife Emine Erdogan, Turkish Presidential spokesman Ibrahim Kalin and Foreign Minister Mevlut Cavusoglu. The Turkish president is due to meet Ader, Hungarian Prime Minister Viktor Orban and Parliament Speaker Laszlo Kover during his visit. Erdogan and Orban are also due to hold a joint news conference following their meeting. The Turkish president and Hungarian officials are expected to discuss bilateral relations, Turkey-EU ties, irregular migration and the fight against terrorism. They will also exchange views on regional and international issues. "The visit will be the sign of the common will at the highest level, aimed at boosting our cooperation with Hungary in every field as part of our strategic partnership," the presidency said in a statement. Erdogan is also expected to officially inaugurate the restored Tomb of Gul Baba in Budapest, attend a business forum with Orban, and pay a visit to the Budapest Turkish Memorial Cemetery. Ankara and Budapest enjoy friendly relations based on historical and cultural ties, NATO alliance, close cooperation within international organizations, especially the EU and the Council of Europe, and Hungary’s support to Turkey’s EU membership.